Most of us have been there at one time or another. The lost job, bad economy or disabling injury that causes our finances to dwindle and our hope to fail. Then when we have stretched our funds as far as they can go… we find we are short of cash for essentials. Peter’s Pantry is here to help with one of the most essential items… food. Just because you are currently going through a hard time doesn’t mean that you, your loved one, or your children should have an empty stomach. Our caring volunteers want to help you in this difficult time and help to provide you with the essential food items to help you on to the next stage of your life. We are not here to give you a hand out… but a hand up so that you can become more confident, strong, and independent. When you enter our pantry for the first time, there will be applications on the wall as you enter. Please take a form, fill it out and bring required registration documents listed on front page to the office when complete. Chris, the manager will register you for the current year and explain the process. Each year in January you will need to renew your registration. 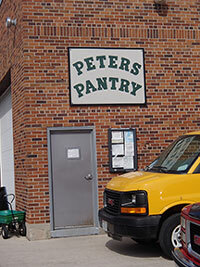 Recipients of Peter’s Pantry will be able to come in once a week and receive food products. Some items have limits on how much can be taken and on other items there is no limit to how much you can take. Our volunteers will help walk you through the process and make sure that you have everything that you need. Unlike many pantries we are not limited to just canned and dry goods. Our selection contains fresh fruits and vegetables, breads, milk, frozen meats and fruit juice. Peter’s Pantry is located at: 843 South 21st Street, Manitowoc, Wisconsin, on the Northeast corner of 21st Street and Franklin Avenue. Please use the door at the back of the building facing the east. We are conveniently located near the Maritime Metro Bus Route number Five.